Last Saturday marked the 40th anniversary of Bruce Springsteen's "Darkness on the Edge of Town," so let's not waste our time waiting . . .
A new study and a brewing federal policy change together highlight contrasting forces that could help shape U.S. power markets in coming years. Two possible futures: The analysis shows the nationwide scope of the trend toward a lower-carbon mix, yet the Trump administration is preparing aggressive steps aimed at halting coal's decline. New data: Carnegie Mellon University researchers are out with a detailed national and regional-level analysis of falling carbon emissions from electricity generation. Overall, it shows a 30% reduction in the average carbon emissions intensity — that is, emissions per unit of power generated — between 2001 and 2017. 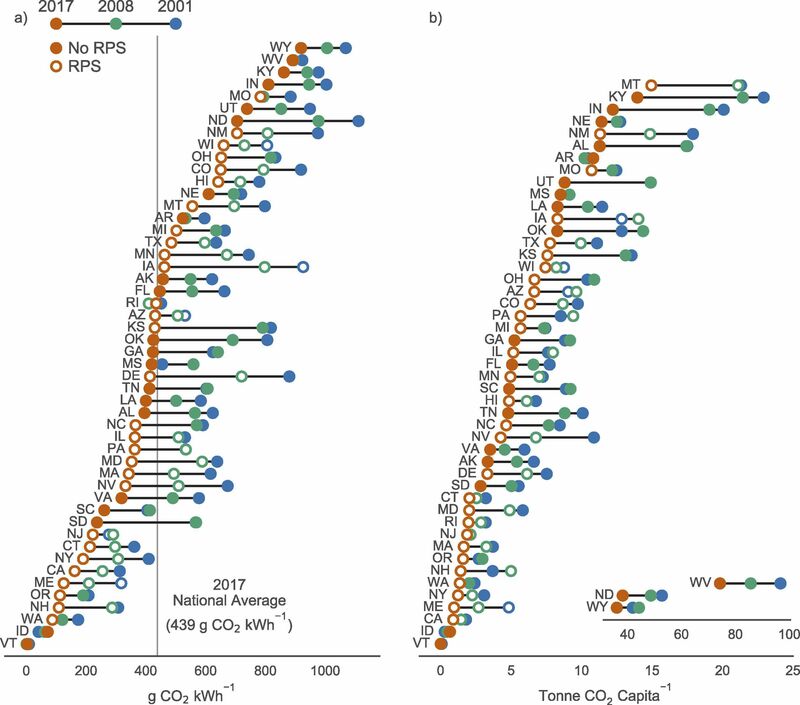 One key regional finding: The paper, published earlier this week in Environmental Research Letters, shows that over the last few years, carbon cuts have occurred in states with and without requirements called renewable portfolio standards (RPS). "Many states were able to reduce the CO2 intensity of electricity generation without these standards, because some have excellent wind resources and others displaced coal with natural gas," co-author Costa Samaras said in an email. Check out the chart above for a state-by-state breakdown that shows which states have renewables mandates. One level deeper: "Delaware and Iowa — with the largest declines — do have RPS policies, but Oklahoma, North Dakota, and South Dakota — with the third, fourth, and sixth largest declines — do not have RPS programs but do have voluntary renewable energy goals," the paper finds. But, but, but: The paper's arrival coincides with emerging White House plans to intervene aggressively to halt closures of coal-fired and nuclear power plants. The intrigue: As we wrote about yesterday, some analysts say the economic lifeline to those plants could erode the ongoing decarbonization of power generation. One interesting wrinkle: In a sign of the known unknowns about the brewing intervention, a Bloomberg New Energy Finance report finds that it could also lower emissions. Why? One option is providing payments for maintaining generation capacity, which might not actually boost coal-fired generation. "Rewarding reactors with the same, however, would probably lead to more nuclear production and could displace millions of tons of carbon dioxide a year," notes Bloomberg in a story on the study. Over in our Expert Voices section, the University of Michigan Energy Institute's John M. DeCicco explores the potential legal fight between California and EPA over a possible federal move to freeze auto emissions rules in 2020. What to watch: The freeze would spark a legal battle with California, which wants to maintain the Obama-era standards. Automakers publicly say they don't want this fight, but they set the stage by investing in groups like the Competitive Enterprise Institute, whose Myron Ebell headed the Trump EPA transition, and by asking the transition team to reconsider the standards two days after the election. Now, they might look for California to make concessions before it enters the risky litigation process. The big picture: Various parties to this debate claim impacts on other issues — jobs, safety and energy dominance — but the critical issue at stake is the climate. Transportation has become the nation's largest source of GHG emissions; the weaker the standards, the less these emissions get trimmed. Trump's freeze would likely lead to an excess of over 100 million metric tons of GHG by 2035. Automakers are trying to persuade the administration to maintain enough of a fuel-economy gain to keep California on board. But, given that a more moderate proposal could reflect poorly on President Trump, it might be too late to control the anti-regulatory juggernaut they've unleashed. The bottom line: California may soon feel pressured to either make significant concessions or gamble that the Supreme Court won't rule against the state's ability to set its own standards. Either way, things don't look good for the planet. "The Trump administration has indefinitely delayed a proposed overhaul of U.S. biofuels policy aimed at reducing costs for the oil industry, under pressure from corn state lawmakers who worry the move would undermine demand for ethanol." New twist: Shortly after his swearing in, Environmental Protection Agency Administrator Scott Pruitt tried to use his position to get his wife a job as a Chick-fil-A franchisee, according to the Washington Post. It's one of several "bizarre" controversies surrounding Pruitt, my colleague Haley Britzky reports over in the Axios stream. Axios' Steve LeVine reports ... Challenged by critics who wanted to take away some of his corporate power, Tesla CEO Elon Musk told shareholders Tuesday that he will break through the 5,ooo-a-week barrier for Model 3 production by the end of June. What's next: Musk also said he will ramp up production to 10,o00 Model 3s a week over the next year, attempting to deliver the kind of news Tesla shareholders have sought about the carmaker's first mass-market electric vehicle. Why it matters: Musk was speaking after shareholders voted down a dissident move to take away his dual title as chairman. The promise of steadily rising production seems likely to mollify investors who have driven down the company's share price. Go deeper: Read Steve's full story in the Axios stream. "General Motors Co. is upping its electric vehicle commitment in China with 10 more electrified vehicles in the heavily regulated market from 2021 through 2023." Why it matters: The announcement is another sign of how China has emerged as a powerful driver of vehicle electrification, thanks to its status as the world's largest auto market and federal policies aimed at greatly expanding deployment. The latest edition of LinkedIn's regular Workforce Report out this morning includes a special focus on the oil patch. "Hiring in the oil and energy industry, on the upswing since its recent trough in mid-2016, rose by 5.2% over the past year." There's a "tight correlation" between crude oil prices, which recently reached three-year highs, and industry hiring. "[W]hen oil prices dipped between January 2015 and February 2016, industry hiring followed suit — and a few months after oil prices began to rise, so did hiring." Hiring in Houston, which the report notes is the U.S. industry's "epicenter," has seen "strong hiring growth (+12.4%) picking up in step with the rising oil prices of the past year." But, but, but: It's worth noting that energy and workforce data compiled by the Federal Reserve Bank of Dallas shows overall oil-and-gas employment remains below levels achieved before prices started tumbling in mid-2014. One more Texas thing: An industry group, Texans for Natural Gas, also released a report this morning, which is on the effects of the shale oil-and-gas boom that's boosting investment in petrochemicals and other manufacturing in the state. It shows that the state's manufacturing output grew by 50% between 2009 and 2016 alongside the growth in shale production, among other findings. 6. Senator warns Pope: Big Oil is "duplicitous"
Axios' Amy Harder writes ... Big oil companies set to meet with Pope Francis this week are being "duplicitous" in their support for addressing climate change, Democratic Sen. Sheldon Whitehouse says in a new letter to the Pope. Why it matters: This letter is a window into the heart of the world’s climate and energy debate: To what degree big oil and gas companies, whose products are warming the Earth but also help run the global economy, are genuine about being part of the solution to climate change. For the record: Industry officials have said they can’t single-handedly change the near-zero appetite Congress has to address climate policy right now, and also that governments in general haven’t done enough on the issue in decades past. Go deeper: Big Oil teeters between enemy and ally in climate fight. "Residential deployments beat commercial deployments, 15.9 megawatts to 11.7 megawatts, according to the latest Energy Storage Monitor from GTM Research and the Energy Storage Association. Even more impressively, home batteries rivaled utility-scale deployments, which only clocked 16 megawatts," they report. The story calls that residential showing compared to other forms "an unprecedented and jolting development that is worth emphasizing." Renewables: I'm a tad late to this, but The New York Times has an informative look at the growth of corporate renewable power purchases, noting that dozens of Fortune 500 companies are investing billions of dollars. Yes, but: "One big question, however, is whether these corporate renewable deals will remain a relatively niche market, adding some wind and solar at the margins but not really making a sizable dent in overall emissions, or whether these companies can use their clout to transform America’s grid and help usher in a new era of low-carbon power," Brad Plumer reports. Climate: Via Carbon Brief, "It is possible to limit global warming to 1.5C and achieve many of the sustainable development goals without 'negative emissions technologies', a new study finds." Trade: Per The Wall Street Journal, "China offered to purchase nearly $70 billion of U.S. farm, manufacturing and energy products if the Trump administration abandons threatened tariffs, according to people briefed on the latest negotiations with American trade officials."